Silver Airways on April 13 took delivery of its first ATR 42-600 at the Toulouse plant for ATR. The pictured N400SV (msn 1214) sports a bright new livery featuring a flamingo named “Bella”. The inscription at the nose reads “Mile Marker Zero” implying there will be more images from Florida coming on subsequent deliveries. The new Silver Airways logo now features a flamingo. Silver Airways is also featuring flamingos in their ads. 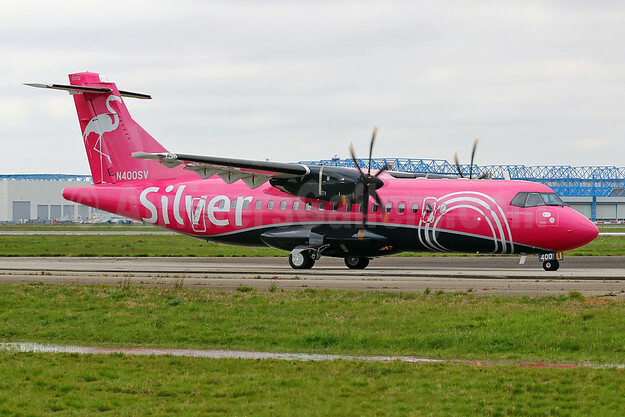 As previously reported, Silver Airways ordered16 ATR 42-600s and four ATR 72-600s. This follows a deal between ATR and Nordic Aviation Capital (NAC) for the purchase of 15 ATR -600s, of which 12 will be ATR 42-600s and three will be ATR 72-600s. These aircraft, along with five from an existing order between ATR and NAC, will be leased to Silver Airways, making them the first operator of ATR -600 series aircraft in the US. The aircraft, an ATR 42-600, will be configured with 46 seats in a 2-2 seating configuration, with a pitch of up to 32 inches. The remaining deliveries are expected to be completed by the first quarter of 2020. Crew training will be conducted by ATR at its new training facility in Miami, which is home to a Full Flight Simulator (FFS) for the ATR -600 series aircraft. The brand new ATR -600s will replace Silver Airways’ existing fleet of 21 Saab 340B turboprops, while increasing the frequency of main routes and opening new air services to destinations in Florida, the southern United States and Caribbean.